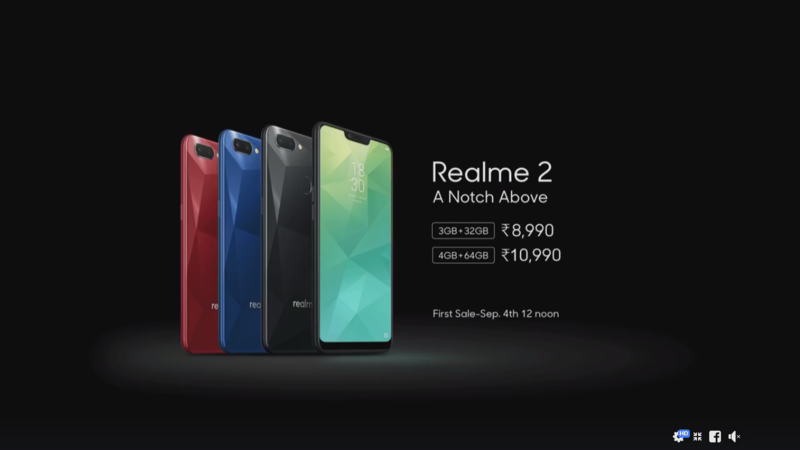 Oppo’s sub-brand Realme finally launched its next smartphone Realme 2 in India today. 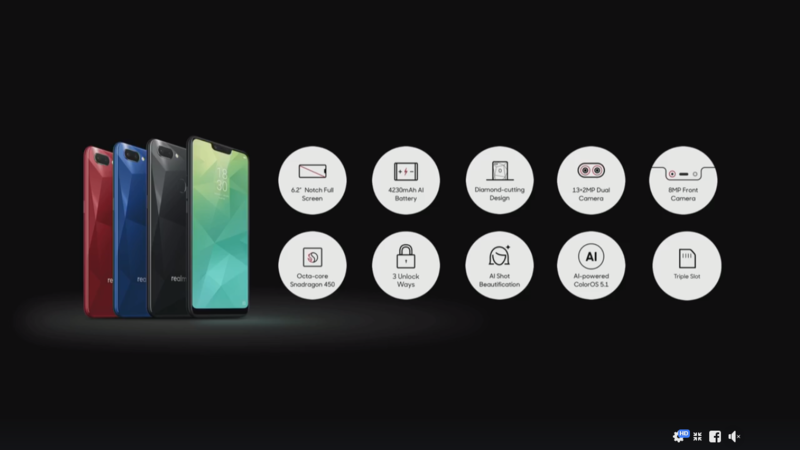 This is the second smartphone from the company and comes with several new features such as a display notch, and a dual camera set up at the back. The Realme 2 sports the company’s trademark diamond cut back design just like the Realme 1. However, it comes with several other improvements in terms of hardware, camera and display over the first smartphone. The Realme price in India starts at Rs. 8,990 for the 3GB RAM and 32GB storage variant. While the 4GB RAM and 64GB storage model costs Rs. 10,990. 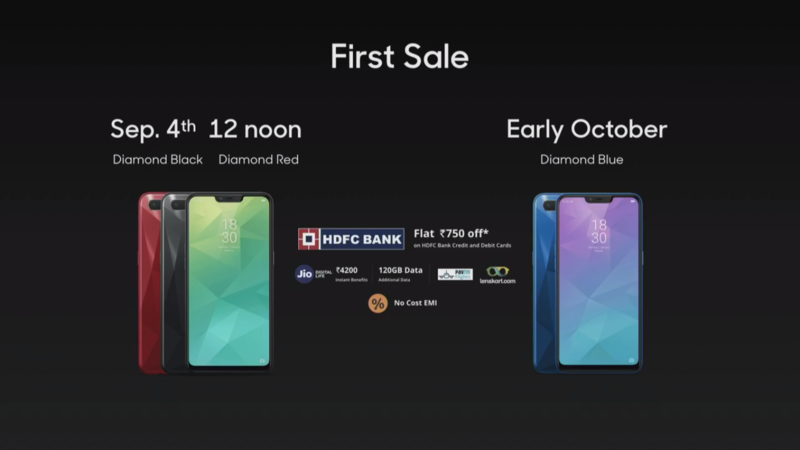 The Realme 2 is a Flipkart exclusive smartphone and it comes in Diamond Red, Black, and Blue colour variants. The Diamond Red and Black colour variants will go on sale from September 4. While the Diamond Blue colour will be made available in October. The company is also planning to launch a pro version of the device as well. If we talk about launch offers, the smartphone will be available with Rs. 750 discount on HDFC Bank credit and debit cards. Reliance Jio will also give 120GB additional data and worth Rs. 4,500 benefits as well. The Realme 2 sports a 6.2-inch IPS LCD display with HD+ resolution. The display sports a notch on top and has a 19:9 aspect ratio. The phone is powered by an octa-core Snapdragon 450 processor with up to 4GB RAM and 64GB storage. The phone has a dedicated microSD card slot. In the camera department, the smartphone sports a dual rear camera setup with a 13MP primary sensor and a secondary 2MP sensor for depth effects. Up front, there is a 16MP front camera with AI shot beautification mode. The front camera also supports face unlock feature, and there is a fingerprint scanner as well. Connectivity options on the dual SIM phone include 4G VoLTE, Wi-Fi, Bluetooth, 3.5mm headphone jack. There is a 4,230mAh battery in the Realme 2. The smartphone runs ColorOS 5.1 based on Android 8.1 Oreo. disappointed with processor n hd+ display.